It is impossible to properly align a machine with a soft foot, but as many types of Soft Foot condition exist it is important to understand the possible causes. Hamar multi-plane lasers are a highly precise and easy to use lase alignment tool for all large machine alignment requirements. Hamar Laser provides highly efficient solutions for precision laser alignment and levelling of a wide range of industrial machinery, allowing installation and maintenance of alignment-critical equipment to be done both much faster and more accurately than alternative methods. Up to three continuously rotating lasers simultaneously create flat and perpendicular X,Y,Z light planes that allow straightness, flatness and squareness in all directions to be determined simply and quickly. A live computer readout of the position of multiple radio targets, operating within a 30m radius, facilitates real time machine analysis and adjustment using this unique laser alignment system. 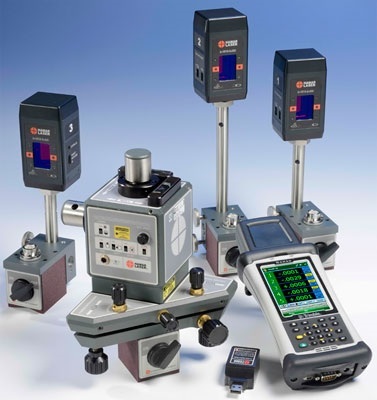 With options for different accuracy levels and system configurations to suit different applications and precision requirements, the Hamar laser alignment system is proven to assist in a wide range of industrial applications, up to and including the most demanding accuracy needs. The Hamar 3-Plane System allows for complete precision laser alignment of large complex machinery. Single plane or two plane systems provide excellent and cost-effective tools for tasks as diverse as precision levelling, flatness checking of large plates and accurately setting up the mating alignment of fabricated components and structures. Hamar Precision Laser Alignment systems reduce the setup time of any precision or large machinery and improve alignment accuracy for faster operation, higher performance and longer life. Reduced line downtime during realignment is able to provide substantial cost savings.